Former UBS and Citigroup banker Tom Hayes is the first person to appear in court in connection with the Libor rigging investigation. The British banker at the center of a global investigation into rigging benchmark interest rates conspired with employees at eight other firms while working for UBS and Citigroup in Japan, according to prosecutors. 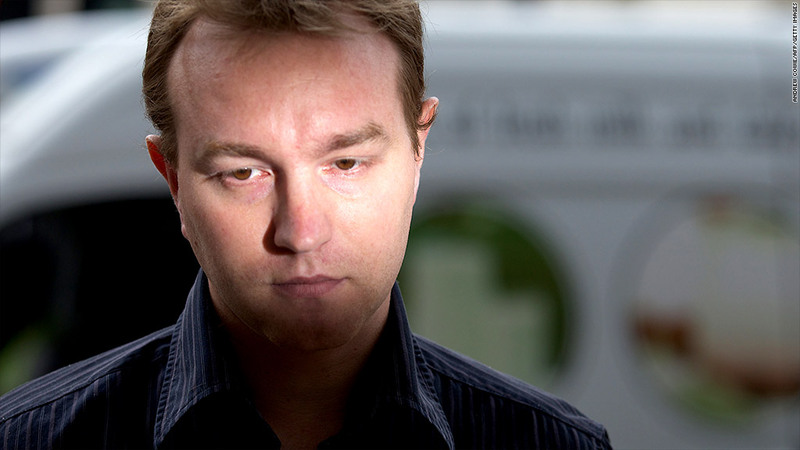 Tom Hayes appeared in court Thursday to hear eight charges of conspiracy to defraud by trying to manipulate the London Interbank Offered Rate (Libor) and other rates between August 2006 and September 2010. Hayes is the first person to face trial in connection with the Libor scandal, a year after Barclays (BCLYF) admitted to taking part in a scheme to rig the benchmark rate used to price loans and derivatives worth trillions of dollars. The British bank paid a fine of $453 million to settle claims by U.K. and U.S. authorities. UBS was fined $1.5 billion in December last year, and Royal Bank of Scotland paid $612 million two months later for its role. Hayes, 33, only spoke to confirm his name, date of birth and residence. His lawyer Lydia Jonson declined to comment when asked what Hayes thought about the charges. Hayes did not enter a plea. While working for UBS (UBS), prosecutors claim that Hayes conspired with colleagues at the Swiss bank and employees at JPMorgan Chase (JPM), RBS (RBS), Deutsche Bank (DB), Rabobank, HSBC (HBC) and brokers ICAP (IAPLF), RP Martin and Tullet Prebon. They also claim that while working at Citigroup (C), he conspired with colleagues at the U.S. bank as well as employees at UBS, Deutsche Bank and ICAP. ICAP said it understood that unnamed employees of one of its subsidiaries had been referred to in the charges against Hayes but said no ICAP company had been charged. "ICAP has provided information to the Serious Fraud Office and continues to cooperate with its investigation," it said in a statement. Tullet Prebon said it had not been informed by any authority that it or any of its brokers were under investigation in relation to Libor. "Tullett Prebon has been asked to provide information to the Financial Conduct Authority and other regulators and government agencies in connection with their enquiries in relation to Libor and is cooperating fully with these requests," it said in a statement. UBS, Citigroup, Deutsche Bank, RBS, JPMorgan and RP Martin declined to comment. Rabobank and HSBC could not be immediately reached for comment. The case was referred to a higher court, with a preliminary hearing set for July 4. Hayes was granted bail on condition that he surrender his passport and not make contact with others named in the bail conditions. Those names were not read in court at the prosecutor's request. -- CNN's Carol Jordan contributed to this article.